Reality Check: Do Oscar Losers Get Free Space Tourist Flights? It's tough to feel sorry for the actors who failed to take home an Oscar at last night's Academy Awards ceremony. After all, the losers still have money, looks, fame, adulation and — if some reports were to be believed — a free trip to outer space. The New York Post reported that commercial spaceflight firm Virgin Galactic apparently gave a free orbital spaceflight on its SpaceShipTwo craft to each non-winning Oscar nominee. The tickets — which would be worth at least $200,000 — were reportedly stuffed into consolation "swag bags," along with the usual jars of caviar and face cream. Other media outlets, including People magazine, picked up on the story. The only problem is, it's not true. 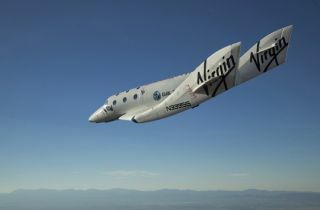 Virgin Galactic's SpaceShipTwo is a vehicle designed to fly six passengers and two pilots to suborbital space and back. The spaceliner is designed to launch from a high-altitude carrier craft — a mothership called WhiteKnightTwo. The first SpaceShipTwo, called the VSS Enterprise, has already aced multiple glide tests, and it's expected to make its first rocket-powered test flights sometime this year. The first passenger spaceflights could take place in 2012, at a price of $200,000 per seat, company officials have said. Virgin Galactic announced today that it has signed a contract with the Southwest Research Institute to ferry scientists and their experiments to suborbital space. After a series of suborbital successes, trips to orbital space could be next on the slate, Virgin Galactic officials have said. So millionaire movie stars can play with their models of Virgin Galactic's SpaceShipTwo, but when the time comes, they won't get a free ride. They'll have to pay, just like the rest of us.